Economic high-performance IP44 downlight. Deep cut-off angle for glare control and comfort. Osram LED technology and enhanced diffuser design for outstanding uniformity. 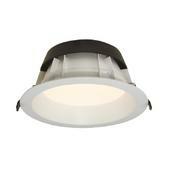 Downlight design allows installation of existing hole-cut outs from 200mm to 220mm. Polycarbonate housing with unique thermal management for durability and optimum lifespan. Dimmable, Emergency and Dimmable Emegrency options. Supplied c/w Remote Driver.